When you copy and paste a selection in the Timeline or Xsheet view, you are not copying and pasting the actual drawings, you are pasting the exposure. 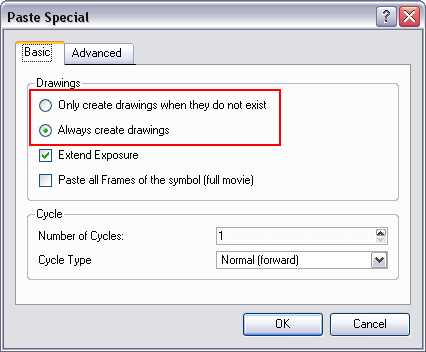 If you want to copy and paste the selected drawings into a different layer or paste the selection in the same layer to duplicate the drawings, you must use the Paste Special feature. This option pastes all of your drawings as they are. If a drawing has the same name as an existing one, it is renamed and duplicated. This option only pastes only the drawings that are named differently from existing drawings. If a drawing has the same name as an existing one, it is ignored and not pasted. This avoids duplicating drawings in your layers. This option is useful when you are pasting cut-out character templates containing drawings you may already have in your scene and some new ones. Using this option, you only paste the new drawings and are not duplicating all of the other parts you already have. 1. In the Timeline or Xsheet view, select the drawings to copy. 2. In the Timeline or Xsheet view, select the cell where you want your pasted selection to start. 3. In the top menu, select Edit > Paste Special or press [Ctrl] + [B] (Windows) or [⌘] + [B] (Mac OS X). You can also click the Paste Special button in theTimeline View andXsheet View toolbars’ extra buttons. 4. Select the Basic tab. 5. In the Drawings section, select the Always Create Drawings or the Only Create Drawings When They Do Not Exist option depending on what you need. If you want to perform another paste special operation using the same settings you used previously, you can use the Paste Special Again command instead of the Paste Special command. This feature paste your selection using the same settings you used in your last paste special without opening the Paste Special dialog box. To use the Paste Special Again command, select Edit > Paste Special Again or press [Ctrl] + [Shift] + [B] (Windows) or [⌘] + [Shift] + [B] (Mac OS X). You can also click the Paste Special Again button in theTimeline View andXsheet View toolbars’ extra buttons.